No one ever said raising teenagers was easy, but if you’re feeling knee-deep in mood swings, unmotivated behavior, bad grades, and irritability, it may not be entirely related to the growing pains between adolescence and adulthood. Instead, those behaviors could be key indications that your child is among the 40 percent of adolescents not getting enough sleep at night. While getting a full night’s sleep might seem more like a luxury than an obligation as we get older, sleep deprivation could be detrimental for students. But what if there’s more to why children and teens aren’t getting as much sleep during the school week as parents would like? To learn more, we surveyed 1,000 parents about the negative role the public education system plays in their children’s sleep health, what else is blocking them from getting the rest they need, and whether student sleep is within their control. Here’s what they had to say. When it comes to getting the rest they need, teens could be at a disadvantage. In 2014, 93 percent of American high schools and 83 percent of middle schools started classes before 8:30 a.m. According to the Centers for Disease Control and Prevention (CDC), those early start times can be unhealthy. 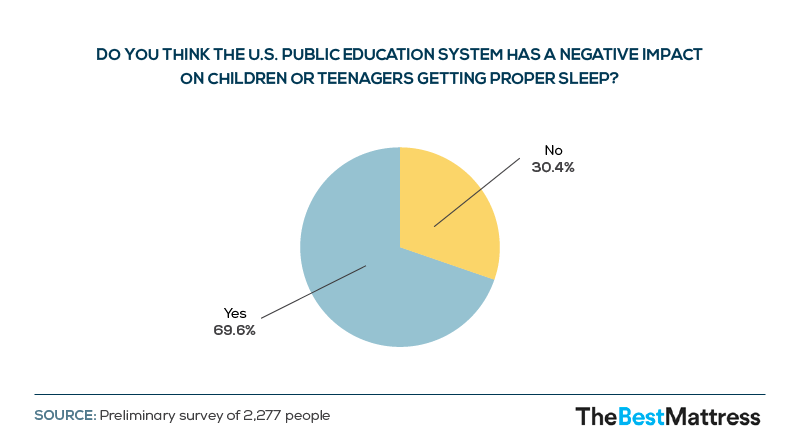 Nearly 70 percent of the initial 2,277 people polled agreed the U.S. public school system had a negative impact on children and teens getting proper sleep. For teens, getting enough sleep is like getting enough food and nutrients during the day. Rest isn’t just about relaxation; it’s also about mental and physical health. Rest plays a critical role in maintaining a robust immune system, focusing during class, and having a positive mood. While experts recommend teens get between eight and 10 hours of sleep every night, they also admit the adolescents’ natural sleep cycle puts them at odds with a traditional school schedule. Kids’ bodies aren’t meant to wake up that early when they typically go to bed after completing sports, homework, and family obligations. Parents may struggle to get their kids up in the morning and out the door on time. Even worse, that discrepancy could increase as students grow older. As early as kindergarten, parents said their children got roughly an hour less of sleep than the 9.5-hour average they thought their children needed. 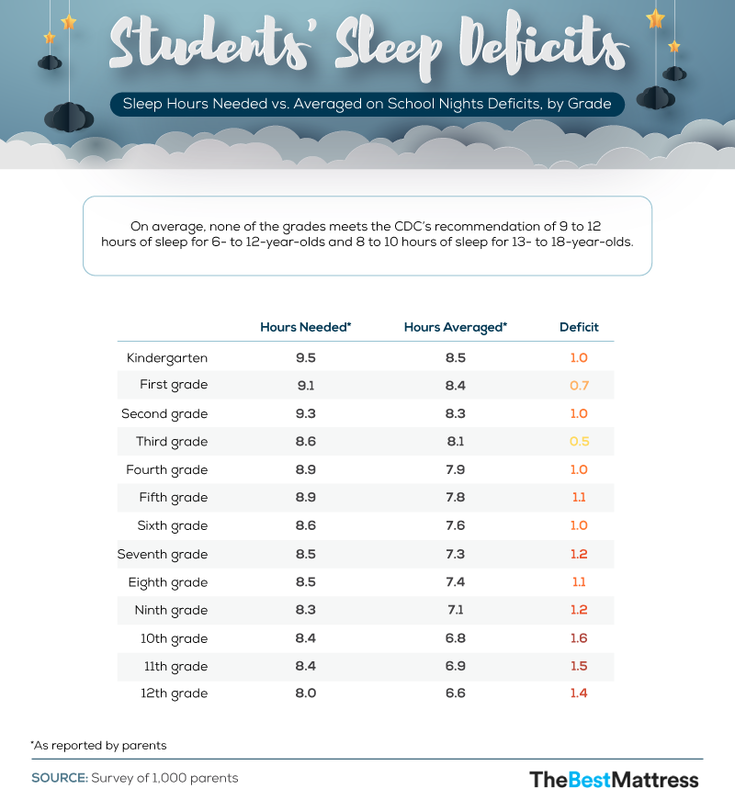 Parents of high schoolers even said their children averaged between 1.2 and 1.6 hours less than what they thought they needed, with none of the grades meeting the CDC’s sleep recommendations. Of the variables likely to disturb a child’s sleep, parents have a certain level of control over what their kids eat, watch, and do before they go to bed. As children get older, however, that control might diminish, leaving sleep deprivation out of parents’ hands. For teens, natural surges in hormones, the added stress of school and social factors, irregular sleeping habits, and exposure to personal electronics are just a few factors why parents might feel their children’s sleep patterns are out of their control. While just under 21 percent of parents felt like they lacked authority over their kindergarteners’ sleep schedules, more than half of high school parents had the same feeling. Early start times and more homework may not lend themselves to a conducive educational environment for students, especially when you consider how much sleep they’re losing and the impact those restless nights have on their productivity. If classes are starting at the crack of dawn, the odds are students aren’t getting nearly enough sleep. For children with classes beginning between 7:01 a.m. and 7:30 a.m., parents reported their children sleeping an average of 7.3 hours each night. When school start times were pushed up by over an hour (8:31 a.m. to 9 a.m.), students netted an extra hour of rest on weeknights. Best of all, when the first bell rang at 9:01 a.m. or later, students got the most sleep: 8.5 hours on average. The closer students got to a full 8 hours of sleep or more, the better their grades were. Students with 2 to 3 hours of homework slept just 7.4 hours during the school week. 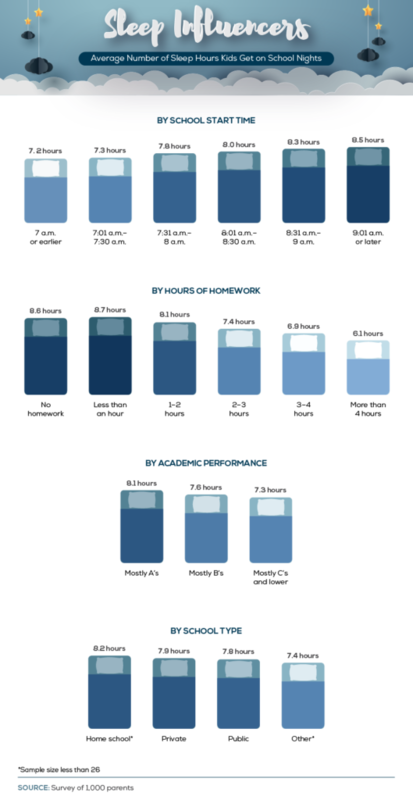 As we found, students getting roughly the same amount of sleep also earned mostly C’s or lower on their course work. Less than 11 percent of parents were of the mind that school start times between kindergarten and high school were entirely appropriate and should stay as they were. Instead, roughly half or more believed school should start later in the day so their offspring could sleep longer (and better). Parents were slightly more split on the subject of homework. 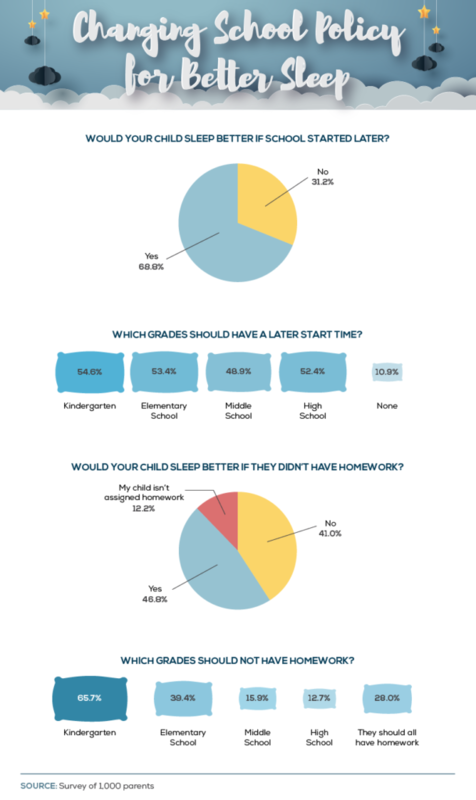 While nearly 47 percent believed their children would sleep better if they didn’t have homework, fewer were inclined to suggest students shouldn’t actually have homework. Twenty-eight percent of parents said children should get homework at all grade levels. Meanwhile, nearly 66 percent of parents didn’t think kindergarteners should have assignments sent home and less than 13 percent said the same about high school kids. What gets in between students and their sleep may change as they get older. More than school start times or homework assignments (which may be out of parents’ control), it was TV and video games they believed presented the biggest problems. 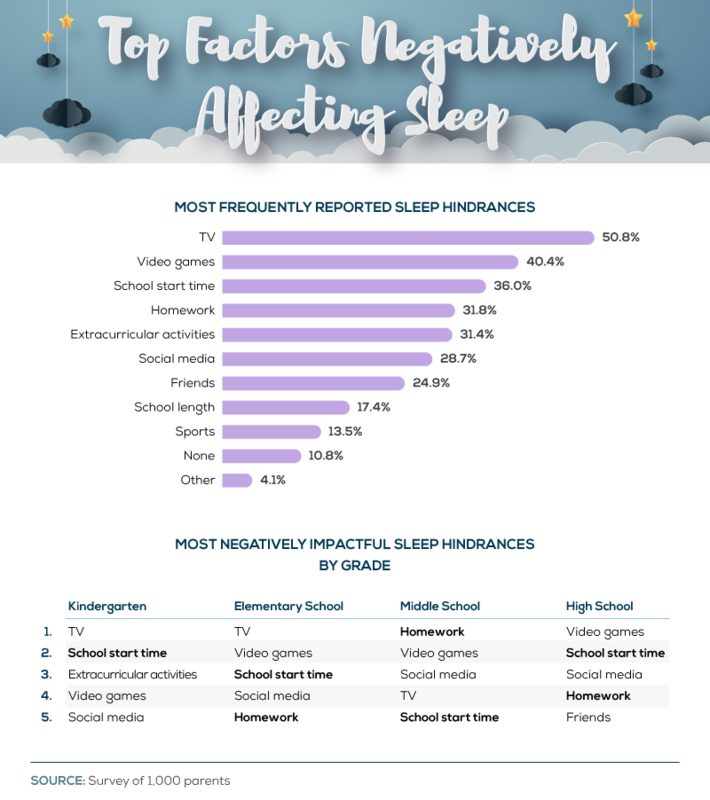 Particularly during kindergarten and elementary school, TV was seen as the most significant contributing factor to poor sleep, according to parents polled. Only among middle school students was homework seen as the leading culprit of sleep deprivation, beating out both video games and social media. For high school students, parents were more inclined to suggest video games were the primary reason students didn’t get enough sleep. Video games can certainly be addictive for some, and experts suggest playing between four and five hours a day leaves students with no time for socializing, homework, or sports. Getting a good night’s sleep regularly won’t just ensure your children stay happy and productive while they’re at school – it can also help ensure they grow up with the right sleeping habits. Many parents believed early start times at school and homework kept their children up at night, but many felt powerless about it. You may not be able to change what time your child has to wake up for school, but you can make sure every second they spend sleeping counts. Just like adults, students need a mattress solution that helps promote longer, deeper sleep for a more energized morning. Find the perfect fit at The Best Mattress. We collected survey responses from 1,000 parents. Only parents with children between kindergarten and 12th grade were included in the full study; all others were disqualified. The average age of the children being reported on in this study was 9.7 years old. The data we present rely on parental self-reporting. There are many issues with self-reported data. These issues include but are not limited to: selective memory, telescoping, attribution, and exaggeration. Therefore, data referencing exact hours of sleep may be inaccurate or limited insofar as all self-reported data are limited. Want to help students get better sleep at night? We welcome the sharing of this study and all of the related graphics within for any noncommercial use. Just include a link back to this page so that your readers can see our complete findings.